San Diego’s homeless tents have fallen far short of contractual targets to move their clients into permanent housing – and that’s not altogether surprising. Through the end of May, just 12 percent of homeless clients staying in the three tents in Barrio Logan, East Village and Midway had moved onto permanent housing, far short of the 65 percent goal city leaders set when they approved the tents. City officials could have predicted struggles before they set those goals. Now, city leaders are forced to grapple with the results the tents have delivered as they also debate the structures’ future. Mayor Kevin Faulconer has committed to leave the tents up indefinitely while some City Council members have questioned whether they have been an effective investment. One thing is certain: Goals set last year aren’t working, and adjustments are likely. It’s useful to understand what went wrong as the city prepares to update the shelter contracts. 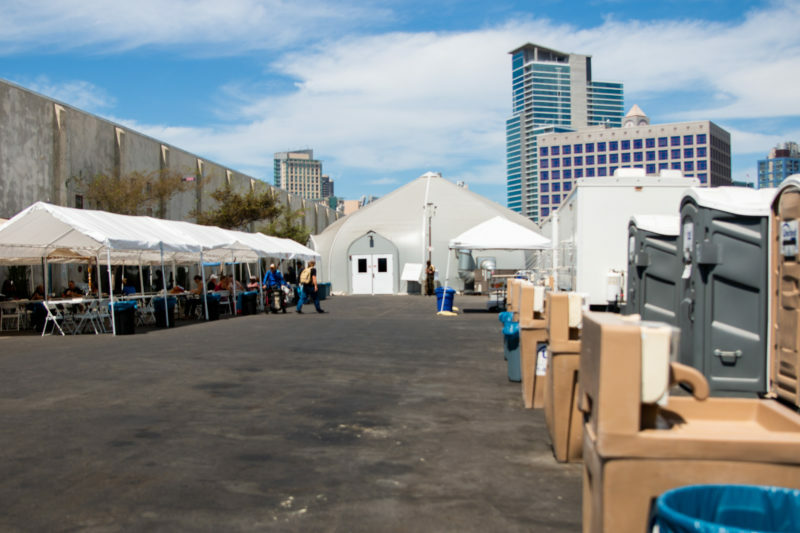 Last year, amid a deadly hepatitis A outbreak, Faulconer and other city officials set aside typical city processes to quickly erect industrial-sized tents to provide safe havens to hundreds of homeless San Diegans. Sole-source contracts with nonprofits Alpha Project, Father Joe’s Villages and Veterans Village of San Diego initially lacked a fundamental requirement included in the city’s other shelter contracts: a targeted percentage of clients who would move onto longer-term housing and permanent housing. The city and nonprofits were at first hesitant to include targets. Nonprofit leaders said they didn’t know what to expect from the new countywide system the city would rely on to help move people into the shelter and onto housing. Jonathan Herrera, the city’s senior adviser on homelessness coordination, also urged caution. “We want to make sure we do right and have enough quality data to make these determinations,” Herrera said last October. But at least two City Council members – Democrats Barbara Bry and Chris Ward – were uncomfortable approving contracts without targets. After all, other city shelter contracts call for at least 65 percent of clients to move into permanent or longer-term housing. It’s one way the city has historically measured the success of its shelter contracts. Nonprofits that run city-funded shelters have not historically met the targets. Father Joe’s has struggled to meet the goal since opening its year-round shelter a few years ago. Yet Bry, Ward and eventually Faulconer pushed for the 65 percent housing targets for the so-called temporary bridge shelters. Those targets might be easier to meet, they thought, because the Regional Task Force on the Homeless’ countywide database of homeless San Diegans in need of help seemed to include hundreds of homeless San Diegans who already had housing vouchers. Ostensibly, that meant many homeless San Diegans who might stay in the tents just needed a so-called bridge to permanent housing and help finding a home. Alpha Project CEO Bob McElroy and others told the city it might be more complicated than that. In the months since, just 12 percent of shelter clients have moved into permanent housing. Advocates and City Council members have raised concerns. City Councilman David Alvarez dubbed the shelters “a complete failure” before a May City Council vote to extend the shelter contracts for three months. At the same meeting, Housing Commission officials said the referral lists produced by the task force had been outdated. Ward, vice chair of the task force and chair of the City Council’s homelessness committee, acknowledged it had taken some time to understand the disconnect and that the city needed to make improvements. Bry questioned whether Sacramento-based consultant Focus Strategies, hired to recommend improvements to the shelter contracts, should also consider a plan to shutter the tents. “At the rate we’re spending this money, it’s not a sustainable model and I think with the consultants we should also ask them to consider developing a wind-down plan,” Bry said in May. Philanthropist and restauranteur Dan Shea, who teamed with Padres general partner Peter Seidler to lobby for and supply two of the three tents to the city, dubbed those suggestions disingenuous. A report produced by Focus Strategies has since called for improvements to increase permanent housing placements – and suggested a lower permanent housing target. The City Council is now expected to vote to update the shelter contracts – and likely, lowered housing targets that reflect the consultants’ recommendations – on Sept. 18.